What a star Rupert Everett is! If you could sum up Red Carpets and Other Banana Skins in three words, what would they be? To hear a great story read by an actor/writer who is wry, self-deprecating, snobbishly outspoken, superbly straightforward, is a total delight. 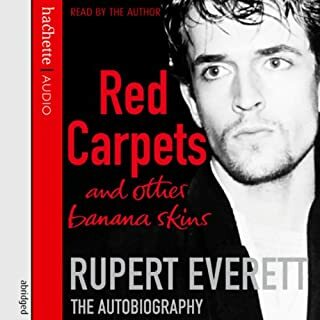 I listened to Rupert Everett's book twice over - and shall do so again! Hugely recommended, HUGELY! What was one of the most memorable moments of Red Carpets and Other Banana Skins? Too many to mention - some moments are evocative, some stingingly sharp, some tear-jerkingly from the heart. What a writer he is and what a life he has lived - so far! It's so out-of-the-closet that you'll feel suffocated if you're still in there!